Once considered a fashion accessory on the face, moles used to be synonymous with “elegance” – after all, everyone is familiar with Marilyn Monroe’s iconic beauty mark on her face. However, the reality is that not all moles are innocent and some do require medical intervention. Not all moles are dangerous, but occasionally an assessment from a medical professional is warranted. Knowing how to tell a harmless mole apart from a cancerous one is especially essential. Whether you have a worrisome mole yourself or you simply want to learn more about nevus syndrome, please keep reading to learn how to identify the key distinguishing characteristics of both benign and dysplastic moles. What Do I Need to Know About the Removal of Moles? Dysplastic Nevus: Can It Turn into a Melanoma? Also known as “atypical moles, ” dysplastic nevi are skin growths that appear different from normal moles. While alarming to encounter, they are not automatically regarded as cancerous or even pre-cancerous. Read more about dangerous moles here. An excessive number of moles on the surface of the body, with one or more mole greater than 8mm across, means that there is an increased incidence of a condition called “atypical mole syndrome” or “dysplastic nevus syndrome”. Dysplastic moles are graded on appearance and deviation from the norm. Some changes may appear mild, while others can be moderate or severely atypical. A is for asymmetry. If you drew an imaginary line down the middle of the mole, would it be a mirror image on both sides? B is for border. Atypical moles have jagged, blurred, or uneven borders instead of smooth borders. C is for color. An atypical mole has more than one color, including blue, white, red, brown, or black. D is for diameter. Healthy, benign moles are usually 6mm or smaller. E is for evolution. 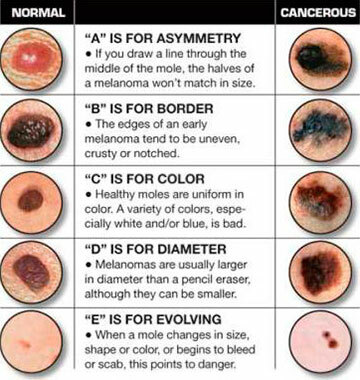 Monitor your moles carefully and note any and all changes, especially any of the ones listed here (including but not limited to elevation, size, shape, border, and color). If your dermatologist advises removal of your atypical moles, then you’re probably concerned about the procedure and healing process. There are generally five methods of mole removal that doctors utilize. Read further about how to remove moles here. Laser Removal: This method uses high powered pulsating beams to destroy the tissue. While mostly painless, this method is rarely used, as it leaves nothing to biopsy. Read more here. 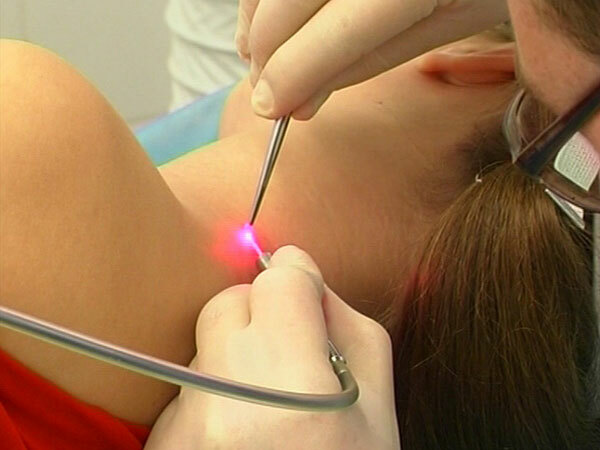 A preferred removal method, a surgeon uses local anesthetic and a scalpel to dig the mole out. Occasionally stitches are required to close the wound. Scalpel Shaving: The area is numbed before a doctor scrapes the nevus off using a scalpel in this treatment; it does not require stitches. This is also a preferred mole removal technique. Cauterization: A doctor uses electrical currents to “zap” the mole. This is painful and rarely used. Further details can be found here. Cryotherapy: Using nitrous oxide, this treatment freezes the mole. While mostly painless, it occasionally results in keloid scarring. For more information click here. The biggest risk to the patient during mole removal is scarring and, occasionally, infection. Proper wound treatment after the removal is essential. After mole removal surgery, monitor the site closely to ensure no unwanted regrowth. Rinse the wound with saline solution or soap and water. Lightly pat it dry, taking care to gently exfoliate away scabs. Do not scrub. Do not use iodine or peroxide on the wound, as it can kill newly formed skin cells. Apply a thin layer of Vaseline (petroleum jelly) over the wound to encourage moist, semi-occlusive healing. Cover the wound using sterile gauze, sealing in the moisture. Wound healing occurs twice as fast in a moist environment. It’s also wise to avoid direct sunlight while healing from mole removal surgery, as ultraviolet light can promote malignant cell growth. If your mole removal was on your face, abstain from wearing cosmetics during the healing process, as that can lead to infection. For those who suffer from dysplastic nevus syndrome, the fear of a benign mole turning into something malignant is a very valid fear. While an atypical mole isn’t always a precursor to cancer, there are certain demographics who are more likely to develop skin cancer. On average, 1 in 5 people under the age of 70 will suffer from skin cancer. The fact is, anyone can get skin cancer. 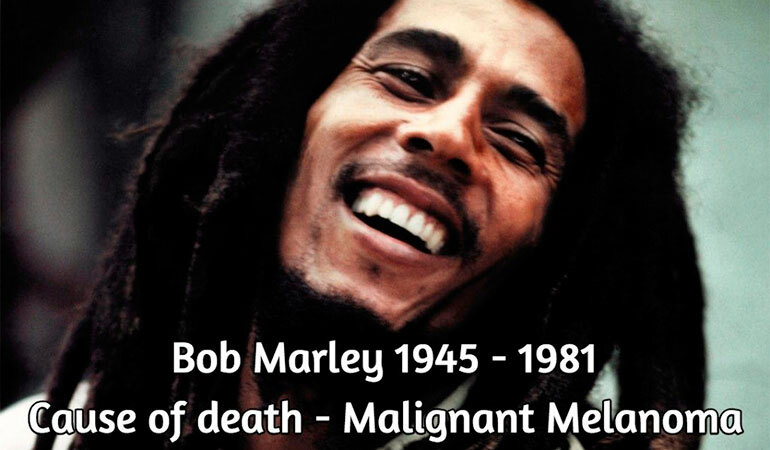 Fair-skinned people: While melanin helps protect against dangerous UV rays, famous reggae singer Bob Marley died at the age of 38 of skin cancer, so all ethnicities can develop melanoma. People who spend time in the sun: Use sunblock and avoid the sun when it’s high in the sky (between 10:00 in the morning and 2:00 in the afternoon). 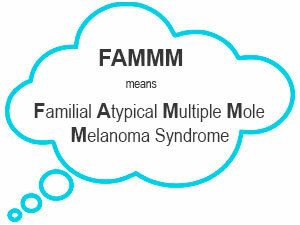 Anyone with a genetic predisposition: Those with atypical mole syndrome and first-or-second degree family members with melanoma may have Familial Atypical Multiple Mole Melanoma Syndrome (FAMMM), which greatly increases risk. While having dysplastic nevi doesn’t always mean that someone will develop melanoma, having five or more atypical moles increases the risk tenfold versus someone who does not have any. The more atypical moles on the body leads to a higher risk overall. More information about melanoma treatment can be found here. On average, one person dies every hour of melanoma. To avoid becoming a grim statistic, take precautionary measures to protect yourself. 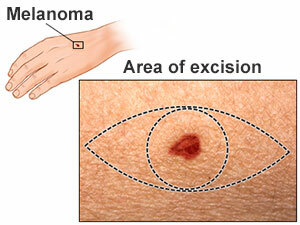 To learn more about signs of melanoma, click here. If you score lower on the Fitzpatrick Skin Type Scale, have a family history of skin cancer, and have an excessive amount of moles on your body (especially atypical moles), then it would be wise to closely monitor your skin and report all changes to your dermatologist or physician. While an annual wellness exam is usually recommended, for those who are at increased risk, more frequent visits to the doctor are advised. If you have more than five dysplastic moles, a checkup frequency of every six months is recommended. With a family history of melanoma, the frequency is increased to every three months. Removing the mole does not necessarily prevent cancer from forming. Since dysplastic moles are not automatically cancerous, removing them is not a guaranteed prophylactic method of treatment. Even if you removed all the moles from your body, you could still spontaneously develop skin cancer. This is because the primary characteristic of the cancerous cell is abnormal growth of cells; even in absence of moles, a new skin growth could form and turn into cancer. If you’re at high risk, visit your doctor regularly. While it may seem inconvenient, skin cancer is far worse than any trip to the doctor may impart. It changes in size or shape. It bleeds or oozes discharge. It becomes hard to the touch becomes lumpy. It becomes scaly or dry. It changes in appearance in any shape or form. Your doctor will make a judgment call based on the presentation of the nevus. If a mole is alarming, then your physician may advise removal of the mole, including sending a sample to a laboratory for a biopsy. If you or someone you know is suffering from dysplastic nevus syndrome, take a deep breath and relax. It’s not an automatic death sentence; many people have unusual moles and live long, happy, healthy lives. 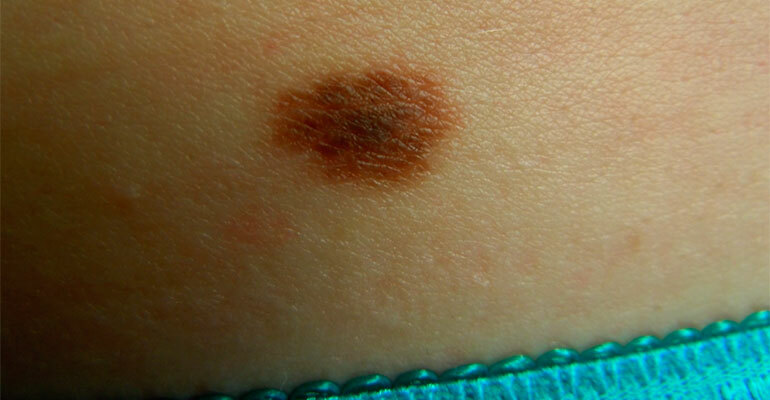 Congenital Melanocytic Nevus: This is a mole that shows up at birth. Depending on the size of the nevus, the increased risk of melanoma is about 10%. Small nevi are lower risk, whereas larger ones (such as “bathing trunk nevi, ” ones that span the back and buttocks) are more dangerous. Compound Nevus: These are another type of melanocytic (meaning that they arise from skin pigment cells) nevi and are usually raised and tan or brown. They’re also regarded as benign and average between 2mm-7mm in size, but they should be monitored regularly for any changes. 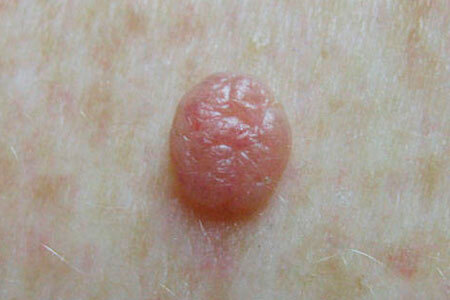 Junctional Nevus: Like compound nevi, these are also melanocytic and may be congenital. These tend to be flat and flush with the skin’s surface. They should also be monitored for atypia and treatment should be sought if any changes occur. Knowing what is normal for your body and being mindful of changes, no matter how mild, is of the utmost importance. Most people have less than 40 moles on their bodies, whereas others may have an increased incidence of nevi. Even a moderate increase of atypical moles can lead to an increased cancer risk, so always stay vigilant and, if necessary, enlist the assistance of a loved one to help check those hard-to-see spots (like back, scalp, and buttocks). By heeding the advice in this article, and staying mindful, you can remain healthy even with severe dysplastic nevus syndrome! You can find further details of Types of moles here.